Optical satellite communication and free space optical communication are wireless telecommunication networks that provide optical data signals at high bit-rate using free space as a mode of median for communication. The global optical satellite communication market generated revenue of US$ 297.2 Mn in 2017 and is expected to reach US$ 4,238.7 Mn in 2027 at a CAGR of 31.5% during the forecast period. Various advantage of wireless communication such as lower deployment cost, easy construction of network topology, and flexible maintenance of operating networks have increased the number of mobile users globally. For instance, the number of smartphone users globally is expected to reach 6.7 billion by 2022 up from 4.3 billion in 2017. Hence, this increasing number of mobile phone users has increased the demand for high speed data transmission. Moreover, increasing multimedia services such as video-on-demand, audio-on-demand, and peer-to-peer have increased the need for high network bandwidth. In addition, increasing adoption of various advance technology such as machine to machine communication and Internet of Things also drives the demand for high data rate which has accelerated the optical satellite communication market globally. On the basis of application, the backhaul segment is projected to expand with the highest CAGR during the forecast period. Demand for high data rate is increasing due to adoption of various advance technologies such as M2M communication, Internet of Things etc. which require gigabit capacity. For instance, by 2022, M2M communication devices are expected to reach 14.6 billion, up from 6.1 billion in 2017. Hence, this significant growth has led to the need for reconfigurable broadband communication networks with high data rates. Moreover, increase in mobile traffic has also enhanced the demand for more bandwidth and large number of backhaul connections. For instance, by 2022, smartphone users are expected to reach 6.7 billion, up from 4.3 billion in 2017. In addition, development of next generation mobile network (5G) requires high data rate (high speed and bandwidth capacity) which drives the need for high capacity backhaul links. Optical satellite communication has the capability to provide gigabit capacity backhaul links due to its low cost and rapid development speed as compared to conventional backhaul technology such as RF. With the integration of ultra-short pulse (USP) laser, optical communication can provide up to 10 Gbps backhaul connection and with the help of advanced modulation, wireless backhaul can increase up to 100 Gbps which can fulfill the requirement of 5G cellular networks. The Asia Pacific optical satellite communication market is expected to grow with the highest CAGR during the forecast period. India, China, Japan, and Australia are some of the major countries which drive the market in this region. Numerous initiatives by various government agencies of countries in Asia Pacific is the key reason for the growth of the market in this region. For instance, in 2018, space agency ISRO (of India) and France based CNES collaborated for an earth observation mission for high resolution imaging capability in optical and microwave technology. Some of the key players profiled in the optical satellite communication market include Analytical Space Inc., ATLAS Space Operations, Inc., BridgeSat Inc., Hisdesat Servicios Estrategicos S.A., Maxar Technologies Ltd., Mitsubishi Electric Corporation, SITAEL S.p.A, Ball Aerospace & Technologies Corp., Mynaric AG, and Laser Light Communications Inc. The optical satellite communication market report provides analysis for the period 2016–2027, wherein 2019 to 2027 is the forecast period and 2018 is the base year. The report covers all the major trends and technologies playing an influential role in the market’s growth over the forecast period. It also highlights the market dynamics, which comprise drivers, restraints, and opportunities,for the analysis of market growth during the said period. The study provides a complete perspective on the evolution of the global optical satellite communication market throughout the above mentioned forecast period in terms of revenue (US$ Mn). The market overview section of the report demonstrates market dynamics such as drivers, restraints, and opportunities that influence the current nature and future status of this market and key indicators, integration challenges, adoption analysis and trends. Further, key market indicators included in the report provide significance of the factors that are capable of changing the market scenario. These indicators are expected to define the market position during the forecast period and provide an overview of theglobal optical satellite communication market. In addition, market attractiveness analysis has been provided for every segment in the report in order to provide a thorough understanding of the overall scenario in the market. The report also provides an overview of various strategies adopted by key players present in the market. The report segments the market on the basis of component and application. Based on component, the market is segmented into transmitter, receiver, modulator, demodulator, and others. In termsofapplication, the market is classified into backhaul, surveillance and security, tracking and monitoring, earth observation, enterprise connectivity, last mile access, research and space exploration, telecommunication, and others. The report provides in-depth segment analysis of the global optical satellite communication market, thereby providing valuable insights at the macro as well as micro levels. The report also highlights the competitive landscape of the global optical satellite communication market, positioning all the major players according to their presence in different regions of the world and recent key developments initiated by them in the market. The comprehensive market estimates are the result of our in-depth secondary research, primary interviews, and in-house expert panel reviews. 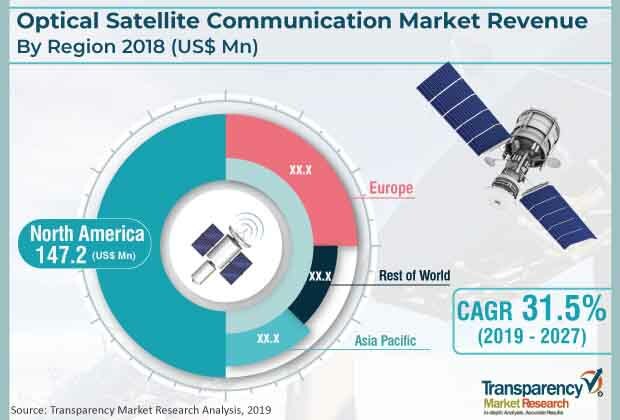 These market estimates have been analyzed by taking into account the impact of different political, social, economic,and technological factors along with the current market dynamics affecting the growth of the optical satellite communication market. This report provides all the essential information required to understand the key developments in the optical satellite communication market and growth trends of each segment and region. It also includes company overviews, strategies, financial information, and developments under the company profile section. The report provides insights related to trends and their impact on the market. Furthermore, Porter’s Five Forces analysis explains the five forces, namely buyers bargaining power, suppliers bargaining power, threat of new entrants, threat of substitutes, and degree of competition in the optical satellite communication market. This report also provides a comprehensiveecosystem analysis of the market. It explains the various participants, including software &platform vendors, system integrators, intermediaries, and end-userswithin the ecosystem of the market. Primary research involves telephonic interviews, e-mail interactions, and face-to-face interviews for detailed and unbiased reviews on the optical satellite communication market, across geographies. Primary interviews are usually conducted on an ongoing basis with industry expertsand participants in order to get latest market insights and validate the existing data and analysis. Primary interviews offer firsthand information on important factors such as market trends, market size, competitive landscape, growth trends, outlook etc. These factors help to validate and strengthen secondary research findings and also help to develop the analysis team’s expertise and market understanding. Moreover, the data collected and analyzed from secondary and primary research is again discussed and examined by our expert panel. The research study includes profiles of leading companies operating in the global optical satellite communication market. Key players profiled in the optical satellite communication market include Analytical Space Inc., ATLAS Space Operations, Inc., BridgeSat Inc., HisdesatServiciosEstrategicos S.A., Maxar Technologies Ltd., Mitsubishi Electric Corporation, SITAEL S.p.A, Ball Aerospace & Technologies Corp., Mynaric AG, and Laser Light Communications Inc.